The charges against Jussie Smollett have been dropped. The Empire actor will appear in court in Chicago on Tuesday for an emergency hearing. Smollett's lawyers announced the news in a statement where they said he was a 'vilified' victim. 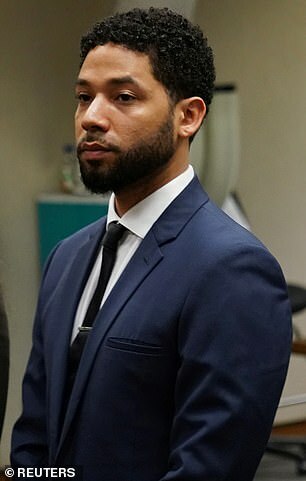 TMZ reports that it was part of a deal under which Smollett will perform community service. In a statement on Tuesday morning, Smollett's lawyers revealed the news. 'Today, all charges against Jussie Smollett were dropped and his record has been wiped clean of the filing of the complaint against him. 'Jussie was attacked by two people he was unable to identify on January 29th. He was a victim who was vilified and made to appear as a perpetrator as a result of false and inappropriate remarks made to the public causing an inappropriate rush to judgement. 'Jussie and many others were hurt by these unfair and unwarranted actions. This entire situation is a reminder that there should never be an attempt to prove a case in the court of public opinion. 'That is wrong. It is a reminder that as a victim, in this case Jussie, deserves dignity and respect. 'Dismissal of charges against the victim in this case was the only just result.